Hear ye, hear ye; a medieval faire goes this weekend. 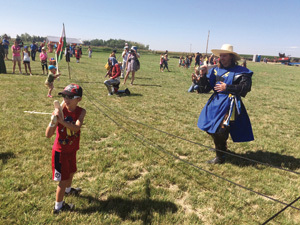 The Windy Castle Medieval Faire is coming back to Coyote Flats Pioneer Village for another round on Saturday, July 28. With 1,200 people descending upon the museum site to get their knight on last year, Windy Castle Medieval Society president Michelle Couper promises that there will be something for everyone. “We’re just big kids. We want to bring the community together by exploring the past,” said Couper, adding people can expect “fun and fantasy” when attending. One big change at the faire this year is, instead of a jousting competition, they are hosting a Battle Royale, where attendees can watch knights fight one-on-one, until only two are left standing. That final fight will be shown at the Royale feast. “They have six to eight knights coming. They will battle one-on-one, winner battling the winner from the next battle, winning the next battle, till the feast at the end of the night, where the two top contenders battle it out,” said Couper. In addition to the Battle Royale, there will be kids crafts, face-painting, carriage rides, archery tag, artisan and food vendors and, of course, bouncy castles, as it wouldn’t be a medieval faire without a castle in sight. Acrobats, a magician and a storyteller will also be in attendance. New this year will be a haybale maze, made possible thanks to one of their sponsors. Although it will just be a “little kids maze”, they are hoping to make it at least six feet high. Couper paid a nod to the museum, thanking them for there support in putting on the faire. Tickets cost $20 for adults, $15 for youth 11-17 years old and those 10 and under can get in for free. Feast tickets are sold separately, and cost $75. You can purchase tickets The Hut and Kapow Comics in Lethbridge, or at Ups and Downs in Picture Butte.